For over 35 years, from the 1960s to 1999, Leigh-on-Sea-based professional photographers John and Rowena Alexander were commissioned to create the front-of-house stills used to entice would-be patrons to see the next weeks’ shows at the Palace. Despite being produced as ephemeral items, we are extremely fortunate that most of the photograph sets taken between late 1972 and early 1999 have survived. Carefully preserved by staff throughout the years, they now hold pride of place in the Palace Theatre Club Archives, where they constitute a unique record. As well as their work for the Palace, John and Rowena were well known throughout the borough, and beyond, for their photographic skills. It is therefore with great pleasure that we celebrate them and their work in these pages. 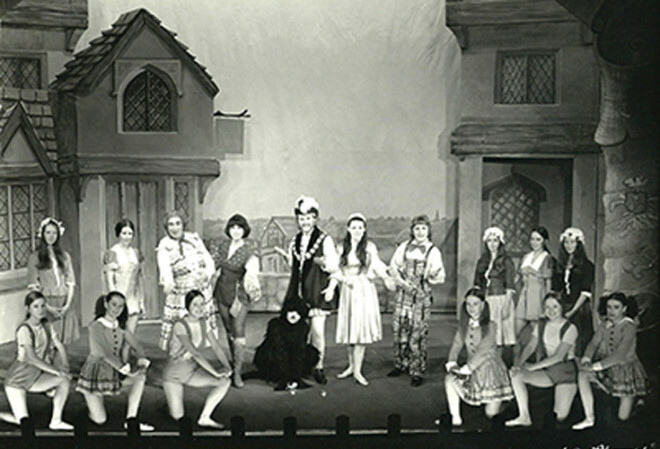 Despite the breadth of their work, it is entirely fitting that they spent so many years at the Palace, as they had a love of the theatre and, indeed, had met when they played Darcy and Elizabeth in a production of Jane Austen’s Pride and Prejudice presented by the social club belonging to St. Margaret’s Church, Leigh-on-Sea. John’s interest in photography came early in life. At school in Streatham, south London, he would secretly photograph the maths master, and then unobtrusively develop the negative by holding it up to dry in the sunlight whenever the teacher’s back was turned! Leaving school, he worked as a photographer for the Air Ministry, while continuing his experiments. He has said that he used to take deliberately out-of-focus pictures of Dinky Toy models, with lots of mist to make them look real – a technique he later put to good use when photographing voluptuous ladies of a certain vintage! After their footlights romance the happy couple were married at St. Margaret’s Church in 1950. A son, Bruce, and daughter, Lindsay, resulted from this union. Setting up the John Alexander Studio at 52 Broadway, Leigh-on-Sea, they first worked at the Palace in the 1960s during the reign of flamboyant man of the theatre Peter (Alexander) Bridge. Later on, when they produced the front-of-house stills, the work required a quick turn-around: the photo call was usually held the day before the shows opened, so they often had to work late into the night to get the pictures ready to be displayed in the foyer the following day. They also photographed shows and artistes at the Cliffs Pavilion. 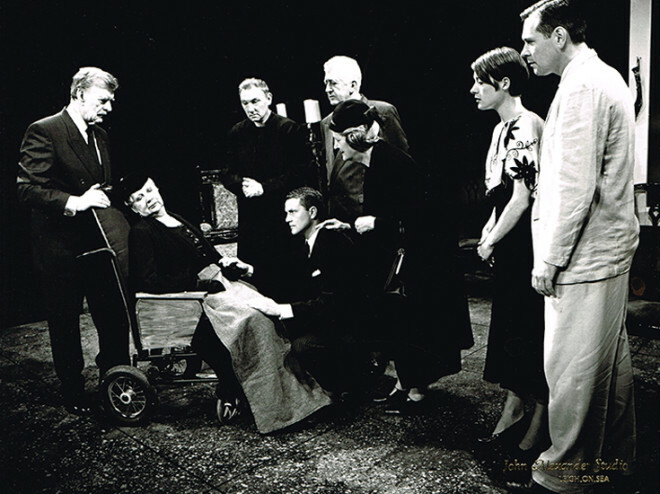 Their long association with the Palace ended in January 1999, with Agatha Christie’s Murder Is Easy, when the theatre staff were made redundant and the theatre endured one of its many periods of closure. Their close association with ‘our’ Palace had unfortunate consequences one day when the telephone rang and the caller said “This is the Palace”. Making a natural assumption, Rowena cracked a theatrical joke, whereupon the caller said “I think we had better start again. This is Buckingham Palace”! On the recommendation of a friend who was a member of the Institute of Mathematics, John was being asked to travel to that Palace to photograph a presentation the Duke of Edinburgh was to make to a member of the Institute. Thankfully, despite Rowena’s faux pas, John did get to fulfil this prestigious assignment! John and Rowena settled into a well-earned retirement in 2000. 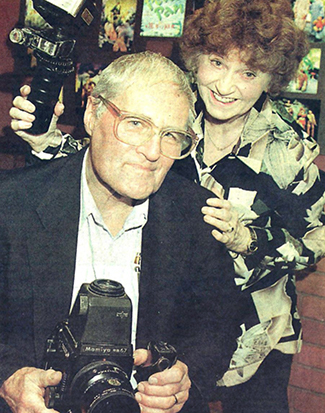 John died on 11th April 2010, but his and Rowena’s legacy lives on in their wonderful photographs. This page was added by Ian Grant on 20/08/2016.